FANTASTIC FOUR (2015). Director: Josh Trank. Cinematographer: Matthew Jensen. Have you ever read a Fantastic Four comic? Did it make you smile? If so, you should probably steer clear of Josh Trank’s FANTASTIC FOUR, a film that I suspect would equate generating a smile with some sort of failure. A word of warning: this review contains SPOILERS. This new retooling of the story takes a few cues from Brian Michael Bendis’ Ultimate Fantastic Four comic, only to jettison any sense of energy or uniformity. It starts out with Reed Richards as a kid talking about how when he grows up, he wants to be the inventor of a working teleporter. His teacher chastises him and tells him to pick a real career. This type of dressing down from teachers is sadly not unheard of. But in this film, the scene rings false, particularly in the relaxed and cruel manner in which these disparaging words are dispensed. Seven years later, Reed (Miles Teller) has made friends with the working class Ben Grimm (Jamie Bell) and the two are ready to unveil their creation at the high school science fair. And it works. Though it creates a loud noise that causes some minor damage to the gymnasium, Reed and Ben demonstrate a fully functional teleportation device in front of hundreds of people. The response on the part of the judges is to angrily mock Richards and Grimm, saying there was no science on display in their project. They disqualify them from the fair, amidst other threats. This is the beginning of a pattern that will be repeated throughout the film. FANTASTIC FOUR relies on characters reacting in ways that defy all forms of logic, simply to move the inconsistent story forward. Brilliant scientist Franklin Storm (Reg E. Cathey) and his adopted daughter Susan (Kate Mara) happen to be standing nearby. They’ve been looking for bright minds to help in their project, specifically the exact same project Reed and Ben just demonstrated. Quite fortunate that a famed scientist was scouting talent at high school science fairs and just happened to be within eyeshot of the exact same invention he and his team have been working on. Reed is drafted to help build the teleportation device for the government. He starts working with Franklin and Susan in New York City’s Baxter Building. There are also two late additions to the team. Johnny (Michael B. Jordan) is Franklin’s biological son. He has a high IQ but he’s also rebellious and acts out against his scientifically minded family. Johnny is working on the project only until he can get his car back. Yes, it’s as ridiculous as it sounds. Victor Von Doom (Toby Kebbell) meanwhile is a troubled loner who had left the project years before, after developing a distrust of the government. He reluctantly joins the team, but exhibits petty jealousy and pines for Susan. The person who we know will become one the Fantastic Four’s greatest adversaries has been written as an immature, socially awkward, pitiful whiner who is shy around girls. The team gets the machine working, teleporting a chimpanzee to an alternate dimension that is called the Negative Zone in comic lore, but referred to as the less inspiring Planet Zero here. This is the only test the teleporter receives, as the government immediately says they are now ready to send human subjects. Our heroes are upset when it is made clear that they will not be the first humans to visit this alternate dimension, the project instead being handed over to trained NASA personnel. This is disappointing but not unreasonable and it’s surprising that anyone besides Victor reacts as headstrong and foolhardy as they do. Before he can sober up too much, Reed even calls up his old friend Ben to join the adventure. The four make the journey, ready to plant an American flag on Planet Zero. But after investigating a strange glowing green ooze, the terrain erupts around them. Victor is lost and the rest of the team barely make it back to their own dimension. They return exhibiting the powers we know them to have. Reed screams as his body stretches, Ben cries out from a pile of rocks and Johnny appears to be a lifeless, flaming skeleton. Even Susan, who wasn’t invited for some unexplained reason, gets a blast of whatever they brought back with them. The whole sequence is over the top in its bid to be horrific. By this point, FANTASTIC FOUR has already failed to impress despite its ambitions. But it is after the team gains their powers that the film truly goes off the rails. Reed escapes from the Area 57 black site while his friends remain in government custody. The military seems less interested in helping the team than they do in using them as weapons. One year later, they have succeeded in doing just that with the Thing, who is now responsible for at least 47 confirmed kills. Yes, the Thing. Benjamin Grimm. A weapon of mass destruction and mass murderer. It’s astonishing that FANTASTIC FOUR seems unaware of the statement it has made. Victor Von Doom is the obvious villain of the film, but it appears as if his innate distrust of the government and everything it stands for was correct. The government wastes almost no time in trying to turn the Fantastic Four into tools, designed to clean up problem areas in the world where governments are fragile and financial interests are high. Eventually, someone remembers that there’s a woman in this movie and Susan is tasked with getting on the internet so they can locate Reed. They do, bringing him back to the facility in a way that makes his earlier disappearance almost completely unnecessary to the plot. The government needed Richards not only for his powers but to rebuild the teleporter. The government couldn’t simply use the schematics or resources from before because… I really can’t remember. Honestly, there was probably some simplistic explanation given but at this point, I had stopped trying to apply any sense of rational thought in regards to FANTASTIC FOUR. What I have described takes up the majority of the film, but it gets worse. Because with just over twenty minutes to go, we finally get the emergence of our villain – Victor Von Doom, still alive and now superpowered. Not only does Doom look ridiculous, he acts that way as well. The film had already painted itself into a corner by confirming Doom’s earlier suspicions about government shenanigans. So without much reason, it now turns him into a genocidal maniac out to destroy the world. The final battle is a mishmash of flying bodies amidst an ugly terrain with a painfully by-the-numbers approach. 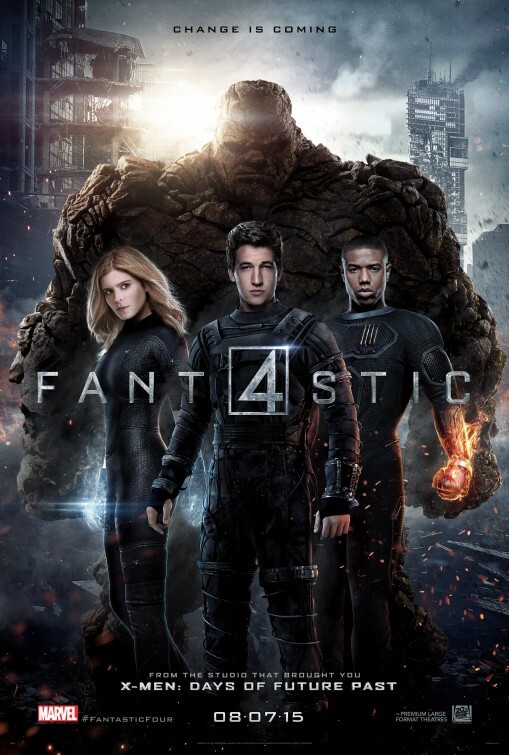 The film can’t even offer decent eye candy since, even at a budget of $122 million, the special effects in the newest FANTASTIC FOUR are worse than those seen in the 2005 version. How did things go so spectacularly wrong? Already we have seen a behind the scenes drama that is more interesting and tragic than anything on the screen. Some reports have suggested that Trank was indecisive and ultimately destructive and that his erratic behavior is to blame for the mess we have now. Trank and his supporters have suggested he had a vision that was sabotaged from day one by people at 20th Century Fox. Does one side deserve most of the blame, or should the responsibility be divvied up equally amongst both sides? We will likely never know the full story. But FANTASTIC FOUR is so unremittingly awful and ill-conceived from start to finish, it’s hard to believe Trank’s original film could have been any better than the grotesque spectacle we are witness to now. There are quite a few depressing similarities to Trank’s earlier film CHRONICLE. In that film, a group of young people discover a strange, otherworldly substance which gives them powers. A few of them learn to deal with their problems while one becomes a villain. Meanwhile, they argue and mope around, one of the group deals with an abusive home life, etc. All of these elements are repeated in FANTASTIC FOUR in the most uninspiring ways. Everyone in the cast appears to be wearing a look of constant regret. One can picture them jumping at the chance to be part of a superhero franchise. Add to that the solid notices Trank received from his earlier film and it should have seemed like a no-brainer. But now they go through their parts, stifled by the terrible script and aware that they have found themselves in a complete misfire. Jamie Bell is miscast, even after he’s played by a walking hunk of rock, a hunk of rock that is no less expressive than the rest of the cast. The character done the most disservice is Susan Storm. It’s appropriate that she is the Invisible Woman, since the film takes every opportunity to forget about her. Of the four, she is given the least amount of character development. As I mentioned earlier, she is not even invited on the initial trip to Planet Zero, despite being an integral part of the teleporter’s development. This is telling. There are lots of hints throughout the film that Trank would have preferred the character didn’t even exist. We are treated to a complete boy’s club with Susan occasionally interjecting dialogue to remind them that women have something to contribute, only to be ignored. There are a lot of problems that doom this film (no pun intended, really), but the biggest is the tone. This is a humorless, bleak film that seems steadfastly opposed to its audience finding any enjoyment in it whatsoever. The only thing more grey and nondescript than the ugly cinematography is everything else. This isn’t a gritty reboot in the vein of BATMAN BEGINS, the DAREDEVIL TV series or even MAN OF STEEL, a film I also disliked. It’s an active battle against anyone mistaking these characters for people who could ever experience or elicit a sense of joy or wonder. A film can be forgiven any sin, save one – the sin of being boring. This is a sin FANTASTIC FOUR commits from its very first scene, only to double-down with each moment that passes. Even the film’s mercifully short running time is betrayed by a narrative that creaks laboriously from one scene to the next. FANTASTIC FOUR is not a film without promise. Unfortunately, it’s a film hell-bent on crushing that promise under the weight of its own sullen pretentiousness. The Worst. When you say that the scene where he explain his future career goal rings false when he’s rejected, okay, why not (but still i found the cruelty justified since they early on said that he has a history of talking about rendom “currently impossible” project like a flying car and such). But on his science fair projet, you must have missed something because it clearly shown that when the basketball stuff blow up, it distract the teachers from his project and they missed the reeapartition of the plastic plane, thinking then that Reed only played a magician trick on them, distracting them to replace the plane to give the illusion that it has reappered from nowhere. They genuely tthink pof a prestidigitation rick, and all the scene is set up for this with the distraction and all. For Doom you also clearly misread his character, he’s not “shy” around Susan, they clearly got a history, we lack screen time to clearly establish the love triangle since the romance has been cut of the theatrical edit. And for the “socially ankward” part, he seems more of an overconfident charismatic leader by my book. He talk don tpo everybody, he’s impulsive, stealing the chalk from reed to rewrite an equation, while they get drunk, from the three he clerly is the guy in charge, standing, tlking the most, sharing his view, making them laugh, giving them drinks, etc. Reed is soccaillty ankward, Doom isn’t. for the all NASA things, yeah, th film’s dumb about it. From what I think, they should have got AStronaute traing alonside them from the begining, getting ready to travel ther while the fantastic engeneers build the thing. Andd then, when it’s ready, get upstet and full jealous of the astronaut position,, enad decide to take their chances to make history. A very human thing to do. A dumb but believable, at least, more believable than how it is set up on screen. for the all drunk thing, it seems like a sort of reference to The Fly from cronemberg. And from the jealousy angle, it’s the kind of way of spirit you have to make scientist reckless. If sue isn’t explain, it seems to have been cut from the edit too, but it’s obviously because she would have refused and call her father,etc, this is what her character would have do. The horror of the transformation is, in term of tone, awesome, we lack films where the characters suffer from the weirdness and horror of their gloomy powers. I even found that they weren’t go as far as they could in my taste. I would have liked it more even more gruesome. The fact that they can’t achieve a new teleporter seems weird yeah, but I guess it is because reed and doom ar no longer here to supervise things, and that they were the only one to truly understandings what they were doing. For Doom, I didn’t find his apperance ridiculous, I liked the way that his mouth look like the originl comics armor because of his suit that now stuck to his face. Its a cool design twist. Plusn Doom is tottaly terrifying and charismatic and these scene. Still I didn’t get why he would’nt try to make the fantastic 4’s heads blow up lol, I guess it wouldn’t ahve worked “because superpowers”, but still I think He would have tried. The final fight was the worst yeah. The set is awfuly unintersting and his plan I didn’t get. Why destroy the earth to get energy? Doesn’t he already have a whole alien terra full of energetic green goo. For what use does he need more? I will wiat for the director”s cut in dvd/bluray before making a final opinon about it. There’s potential in all this, the gloomy, horror tone, the unperfect characters, the designs, etc..
on the other hand, you are fully right about the lack of acting/expressions and the repetition from Chronicle, this this Chronicle meeting The Fly, that’s all. From your rating stuff, I would have called it “diapointing”, because of all it has to offer, and the little it give. This is waisted potential. A body horror film with well known heroes would be awesome, but this film isn’t.